The latest Porsche reveal at the 2018 Geneva International Motor Show exhibits the celebrated automakers most powerful production 911 ever and it is all about being green and mean. 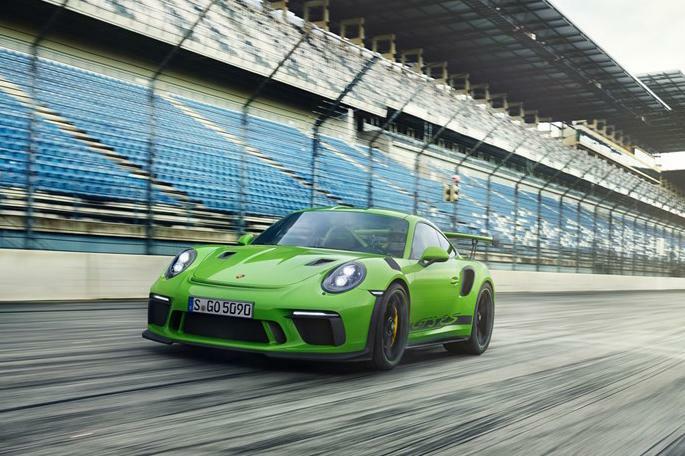 According to the automaker the 2019 911 GT3 RS is the most powerful road-legal 911 so far as it comes fitted with a powerful naturally aspirated engine, a suspension that has recalibrated rear-axle steering tuned for maximum precision and dynamics. The naturally aspirated 4.0 liter flat-six engine in the RS has an additional 20 horsepower, 7 additional pounds-feet of torque and rockets from zero to 60 mph in 3.0 seconds with a top track speed of 193 mph. The exterior of the vehicle is all about aerodynamics and weight reduction and there is a great improvement in both. The front and rear ends of the GT3 RS is made out of lightweight polyurethane, the roof of magnesium and the front trunk lid and the fenders are made of carbon fiber. There are a lot of additions that set it apart from the regular GT3. The car’s color scheme is also something to talk about as you won’t find such a marvelous paint job in any other similar vehicle and isn’t something that you can get from your regular auto collision repair shop in the neighborhood.On the inside it has carbon-fiber shelled bucket seats, door panels and door opening loops, lightweight glass, reduced sound insulation materials and no seats at the rear. All of this comes at a whopping $188,550 and is one of the costliest so far coming from the Porsche stable.